Basically, if the London gold PM Fix is $1,650.00 or higher on Wednesday, then prices will rise for commemorative gold and other numismatic gold coins that are produced by the U.S. Mint. Affected items would be the Proof American Gold Eagles, Proof American Buffalos, First Spouse coins, and the Star-Spangled Banner products containing the $5 commemorative gold coins. The price for the proof Platinum American Eagle, on the other hand, should stay the same. As of this writing, the spot price for gold was $1,662.40 an ounce, so the metal would need to free fall overnight to prevent the following price increases. 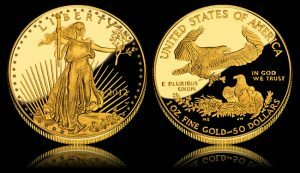 Every Wednesday morning, the United States Mint re-evaluates its prices for coins composed of gold and platinum using a pre-determined pricing policy and price grid. Current gold coin prices are based on a London Fix gold average that falls between $1,600.00 and $1,649.99 per ounce. Since last Thursday to now, the average moved out of that range up to $1,657.28 per ounce. This higher level calls for higher gold coin prices, as long as Wednesday’s upcoming PM fixing agrees. The range being used for platinum coins is $1,550.00 to $1,649.99 per ounce. The platinum average over the past four business days comes to $1,565.87 per ounce, hence the probability of it swinging out of that range using the Wednesday fixings is slim. Typically, when the United States Mint adjusts coin prices, it temporarily suspends online ordering of the affected products until all the changes are made and tested. The process usually begins between 11:00 a.m. and 12:00 p.m. ET on Wednesday and lasts less than 30 minutes. The last price adjustment for the gold coins was April 25, when prices were reduced.